4 drawings on paper, laminated (1 sheet) : ink ; top image 3.75 x 6 in., middle image 2.375 x 6 in, bottom left image 3.125 x 3 in., bottom right image 3.125 x 3 in., on sheet 9.5 x 6 in. Ink drawings of men performing at a talent show on October 3, 1942, including a scene from a play, Hawaiian hula, magic show and recitation of sotry, "Futari Inari". Top drawing of a female figure in kimono and covered hair waving a handkerchief on the right at a man tipping his hat on the left. Heads of audience sketched in foreground ; landscape of a tree, a long road and mountains in background. Similar to bottom image on 97.106.1DQ of a tragic romance, Hototogisu. Middle image numbered 18 of two men, one dancing hula and the other walking with a cane. At left, Takahashi is barechested and wears what appears to be a grass skirt, a lei, a headband and wristbands as he raises his proper left hand. The man on right is dressed in long pants, longsleeves and a hat as he walks with a cane and carries a suitcase over his left shoulder ; pencil notes indicate the shirt is green and pants is grey. Bottom left image numbered 20 of a man, Kamioka, dressed in a kimono and resting his hands on low podium while he recites "Futari Inari". There is a symbol of longevity in a circle on the podium and the Japanese writing indicates it is a present from Alaska. Bottom right image numbered 19 shows Tsunoda in two different poses performing magic with what appears to be a white cloth. Dressed in a dark suit, Tsunoda stands on the left facing the viewer holding a cloth in front of him. In the second stance on the right, Tsunada stands in profile facing right holding the cloth in front of him. 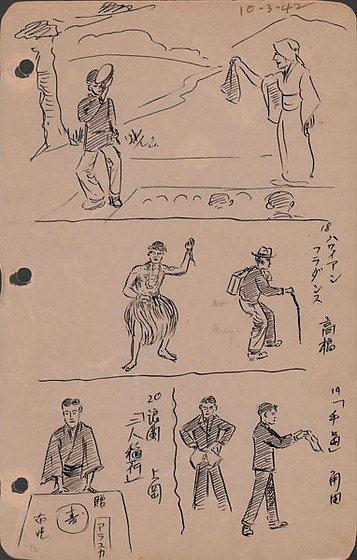 Three additional sketches of men, described in Japanese inscriptions, including one in Hawai'ian costume and one standing behind a low podium or covered table. Written in black ink, top right corner: 10-3-42. Written in black ink on middle image, left: 18 Hawaian Takahashi / hula dansu Written in pencil on middle image: Green [indicating shirt of figure with cane], Gray [indicating pants of figure with cane] Written in black ink on bottom left image, right: 20 Ryokyoku Ueoka / "Futari inari". Written in black ink on bottom right image, right: 19 "Tejima" Tsunoda. Written in pencil, bottom left corner: 12.